How can a country ever forgive and forget its past? 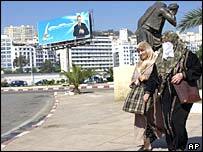 Algerians call it "the black decade", 10 years of civil war in the 1990s that left more than 100,000 people dead. There are no reliable numbers for the killings, just as there are few reliable facts about the war. Many thousands of people are still missing years after the conflict between Islamic militants and government forces was supposed to have ended. Now President Abdelaziz Bouteflika says he wants to forgive the crimes of the past. Mr Bouteflika's Charter for Peace and Reconciliation is designed to turn a page on the country's bloody past. It offers an amnesty to Islamic militants and government forces who are responsible for 10 years of civil war. However, those who carried out the worst excesses - the massacres, rapes and terror attacks - will be excluded. Opponents say that without justice, there can be no reconciliation. They want an accounting for the thousands of people who simply disappeared during the conflict, and they also accuse the government of using the referendum to sweep the past under the carpet. Nasruddin Turkmen runs a small coffee shop in the provincial town of Medea, 100km (62 miles) south of the capital Algiers. He lost two brothers in the war and spent years on the run. His crime was to belong to a party that is still banned today - the Islamic Salvation Front. He opposes the referendum because he says it consolidates power in the presidency leaving many, like himself, outside the political process. "This is like a big jail," he says. "We are like birds in a cage, we are fed but we are not free." As if to amplify the point, the interview is suddenly cut short. The secret police have arrived. The subject is rapidly changed and we discuss the herbal remedies that the region is famous for instead. 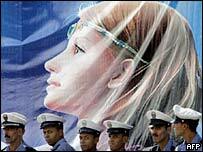 Algeria may have moved away from the worst excesses of the past but it is still a police state. The government says the group to which Mr Nasruddin belongs is responsible for much of the violence of the 1990s. Even today, a low-grade conflict with Islamic militants rumbles on and much of the country is simply too unsafe to visit. Years of conflict have left Algeria, its economy and it people exhausted. There is little enthusiasm for this referendum, but it is almost certain to pass because many are ready to draw a line under the past. In a narrow street in the capital's kasbah, an elderly shopper says she will vote yes. "I'm in favour of national reconciliation, I want Algeria to live in peace, I want the country to pull together," she says. "We want tomorrow to be better." After years of brutality and bloodshed, Algerians may have concluded that an imperfect peace is still better than war.